It’s always great to receive press coverage for our fitness, health and detox retreats. 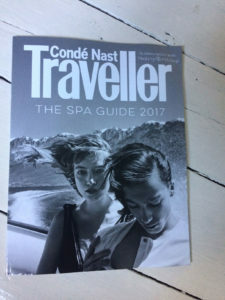 Our latest piece of coverage comes courtesy of Condé Naste, who have featured us in their 2017 Spa Guide. Citing the beauty of our venues and the diversity of our programme, the article goes on to focus how the food, being both delicious and nutritious, makes our unique offering something truly special. You can read the full feature below. It is a testament to the popularity of in:spa that more than half of the attendees are repeat visitors. No doubt this is thanks to a winning formula based not on denial (as per well known Austrian and German clinics) but on a realistic, holistic approach to wellness. The result is a break that feels both physically demanding and self-indulgent. The company has expanded its peripatetic programme beyond Morocco to an outpost in south-west France and, now, Mallorca. Base camp is Cal Reiet, a fantastically smart 15 bedroom manor house: all serene white walls, antique furniture and smooth, creamy locally sourced stone (also used to build Palma’s cathedral). But when in:spa rolls in, it’s in full take-over mode. After hiding all the biodynamic wine from the pool-side restaurant, a crack team of experts devise schedules. Programmes are a mix of combined activities (HIIT workouts, a 10km coastal hike, yoga) and more tailored, emotionally nourishing sessions (personal training, nutritional advice and massages). It’s not particularly flexible, but relinquishing decision making for a week is hugely relaxing, as is exercising in such lovely surroundings. The spacious yoga studio means you’ll never have a sweaty armpit in your face during a vinyasa class. At the heart of the experience is food, a menu of mainly vegetarian dishes such as seed bread slathered in almond butter and avocado, tumeric and pea salad. Yes, it’s caffeine-, wheat- and dairy-free, says nutritionist Tanya Borowski, not because abstinence is a cure-all for everyone, but because this approach impacts the widest range of ailments. She offers specifics too – cutting out wheat to elieve PMT, or increasing time between meals to boost weight loss. Her enthusiasm is so infectious it’s hard not to take a little bit of it home with you, which is surely one of the best things about the in:spa blueprint: a wellness break that makes you feel cosseted when you’re away, and keeps making you feel better, if you keep trying, weeks later. Find out what our other press reviews said about our retreats in our dedicated press section here. Book it: 7 day retreats cost from £2,195 per person full board, including all activities.